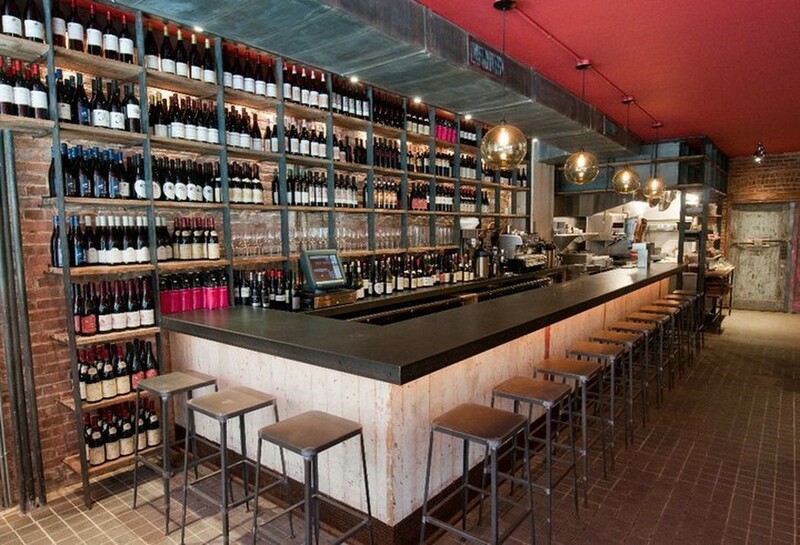 We’re not usually crazy about wine bars. There are a few on this site that we can get behind, but generally we stay away. Why? Well first of all, there aren’t many that serve good food, and it’s rare that we’re heading out to drink without some serious eating on the agenda as well. Second, wine bar crowds are usually a room full of awkward first dates, and that girl who turns bright red after two glasses and spends an hour telling her friend and everyone else within thirty feet how ugly Becky’s bridesmaid dresses were. Inside voices please. So it’s not often that a wine bar comes with an enthusiastic Infatuation Approval, but Terroir’s new outpost in Tribeca most certainly does. Yes, we love it because the food is awesome, but we also love it because owners Paul Grieco and Marco Canora clearly don’t take themselves too seriously. These guys are enjoying themselves, and so are the people that come to their establishments. We found no sign of the typical wine bar crowd, but rather a full house of happy people tearing into some food and drinking (a lot). That’s more our speed. The menu has all the snacks and charcuterie that you might expect to find, but there are also some gems like the meatball sandwich and pretty much anything with the word “balls” in it. Check the Food Rundown for our favorites, and also take a look at this wine menu next time you have a few hours to kill. That sh*t is crazy. An excellent meatball sandwich of a manageable size. We love this, and so do you. Meaty risotto balls with oxtail inside. These are dark and earthy, and really good. Another solid sandwich of veal and diced peppers. Order this and the meatball and split them with someone. Or don’t. Insanely good lamb sausage surrounded by a delicious crust of fried sage. Salty and delicious. This duck confit was delicious, but putting it on frisee and calling it a salad seemed strange. The duck sits on top of the bed of frisee like a wet mop, and let’s be honest - greens under a pile of duck cooked in it’s own fat isn’t really a salad. This would be better if there was just a little less bone marrow. I know, that’s pretty much like saying money can’t make you happy, but this thing looks like it’s got an entire femur’s worth of the stuff on one piece of bread. Give me a few extra pieces of toast, and we’re in business. Midtown wine bars are pretty high up there on the list of places you won't find us hanging out. Read away for the many reasons why. But thanks to good food and a good crowd, Bocca Di Bacco is the exception. The Infatuation loves wine. We drink more than we probably should, and actually have a really solid handle on what's what, and (more importantly) what we like. But when ordering a bottle of wine makes us think we should also order a loan to pay for it, we're not happy.